I wrote this article because I wanted the public, our legal team and mediation team and anyone else who’s willing to listen to know that it is not the prisoners who are lying; instead, it is the prison officials at the very top who are doing all the lying. Our Mediation Team was provided with the truth, written by one of the PBSP subordinates of the warden, Capt. Puget, as to why the meetings were ended. We also believe that Warden G.D. Lewis “sabotaged” the meetings by putting the following gang officials in charge of the meetings: Associate Warden R.L. Swift, former ISU Capt. Barneberg, former IGI Lt. Capt. Olson and Capt. Puget, former appeal coordinator. The state’s motives are and always have been about the targeting and creation of informants, snitches and other low lifes for the sole purpose of creating a population of prisoners who mindlessly operate against their own interest to the benefit of the state. 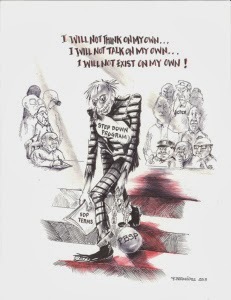 This powerful drawing, “Step Down Program” by F. Bermudez, was enclosed with this statement by the writers. To the state, rehabilitation means rat, because the only way to ensure that the targeted population or prisoner is no longer a threat is by their willingness to inform or lie. The state is not concerned whether or not you know anything; all they are concerned with is whether you are willing to inform. We are dealing with an entrenched mindset. State officials have created their own paranoia with the sheer sensationalization of the unproven, unchallenged reports they fabricate in order to justify keeping hundreds of us confined to control units indefinitely. Folks tend to underestimate the wording of this amendment. We tend to think and/or are conditioned to think that slavery is over. It’s important to reflect upon this because it places into context the role that the judicial branch – the courts – have played in permitting this 148-year experiment to continue. We need not look far to see that in the history of this nation there were no rules governing the operation of a prison. Those matters were left to the absolute discretion of the warden. With the emergence of the prison movement in the 1960s, prisoners began to win some important rights. The United States Supreme Court decided two very important good cases in this regard: Monroe v. Pape, 365 US 167 (1961), and Cooper v. Pate, 378 US 546 (1964). Powerful, racially united strikes and rebellions shook Folsom Prison, San Quentin, Attica and other prisons throughout the country during the early 1970s. These rebellions brought the terrible conditions of prisoners into the public eye and had some positive effects on the way federal courts dealt with prisoners. Prisoners won important federal court rulings on living conditions, access to the media, and procedures and methods of discipline, such as the right to some due process before being placed in disciplinary segregation (Wolff v. McDonald, Cluchette v. Procunier, Wright v. Enomoto), the right to send and receive letters (Procunier v. Martinez), and the “Prisoner’s Bill of Rights,” which guaranteed prisoners a measure of human decency. Accordingly, prisoners won the right to access the court (Bounds v. Smith) and the right to outdoor exercise (Spain v. Procunier). These were pre-validation rulings and were high on the target list of Supreme Court Justice William H. Rehnquist, an extremely activist judge appointed by President Ronald Reagan in 1986. President Richard M. Nixon had first attempted to appoint Rehnquist in the 1970s, having been furious with what he felt was a liberal Supreme Court granting citizens Miranda Rights and the right to be represented by counsel at trial. Rehnquist, like Clarence Thomas and Antonin Scalia today, does not believe that the constitution applies to prisoners. Rehnquist openly questioned whether the constitution afforded prisoners the right to access a court or whether the state should be required to inform arrested citizens about their right to remain silent. In the meantime, prison officials invested a lot of capital in their scheme to divide and conquer, fomenting violence, pitting prisoners against each other and effectively stifling the political influence that the 1960s era of “progress and struggle” had on the concentration camps, giving rise to the era of “roll back and repeal” and “gang validations” under the guise of fighting gang activity. Rehnquist, like Clarence Thomas and Antonin Scalia today, does not believe that the constitution applies to prisoners. Unfortunately, the federal courts did not stay receptive to prisoner’s struggles for long. In 1996, Congress passed and Bill Clinton signed into the law the Prison Litigation Reform Act (PLRA). The PLRA is extremely anti-prisoner and designed to limit prisoners’ access to federal courts, legally permitting discrimination against a specific class of individuals: prisoners. The PLRA has given rise to what is known as judicial deference – deferring to the judgment of prison officials – in matters of prison management. This analysis was brilliantly articulated in an article in the January issue of Prison Legal News (PLN) by Sharon Dolovich entitled, “Forms of Judicial Deference in Prison Law.” I will only paraphrase the article here as it is important to the analysis of the STG/SDP Pilot Program. We must pay attention to this phrase and what it actually means. In her article, Ms. Dolovich explains that in cases concerning prisoners’ rights, the imperative of judicial deference takes three forms: First, and most obvious is doctrine constructing. In this respect, deference to prison officials is written right into the substantive constitutional standards yielding rules of decision that tip the scales in favor of the defendants – the state. Second, deference is used to justify procedural rule revising in ways that transform familiar aspects of the legal process into more inherently defendant (state)-friendly procedural mechanisms. In other words, if the Federal Rules of Civil Procedure require the pleadings to be read in the light most favorable to the party against whom summary judgment is filed, typically a prisoner, in most cases, deference prevents this rule from benefiting the prisoner. Third, deference spurs situation reframing or recasting of a procedural or factual history in ways that enhance the defendant’s (the state’s) position at the plaintiff’s (the prisoner’s) expense. Here is where a court will completely ignore a prisoner’s factual allegations and reframe them in a way that bolsters the defendant’s position and make it easier for the court to dismiss and/or deny the prisoner’s case. This explains what’s kept their policies so vague and their constant schemes to replace one hoax with another any time their methods are questioned to any appreciable degree. When the courts permitted indeterminate confinement for non-disciplinary reasons, it did so because the state convinced them that said confinement was not for disciplinary reasons or punishment (Toussaint v. McCarthy) and that CDCR would review those placed in segregation for administrative reasons, considering them for release every 120 days. Well, 30-plus years have yielded ample evidence of the punitive nature of this kind of segregation with the opening of Pelican Bay in 1989 and administrators smugly proclaiming to the world that these guys are the “worst of the worst” and then going about the task of selling that notion, which necessitated the creation of a little crime and some violence to a certain degree! Who says crime doesn’t pay? With this scheme, they arbitrarily changed the Toussaint requirement to review for release. Now the only way out would be to parole, debrief or die! Shortly thereafter Madrid v. Gomez was litigated. The case was initially taken because – to his credit – U.S. District Judge Thelton Henderson grew concerned about the large number of excessive force complaints the court was receiving from Pelican Bay prisoners. The case, while setting some guidelines to monitor the use of force, turned its focus largely toward the mental illness aspect of confinement to Pelican Bay SHU – i.e., sensory deprivation. It would add another layer to the validation procedure by requiring three independent sources to justify SHU confinement, while changing absolutely nothing. The court side-stepped the issue, leaving prisoners to languish and die, based on sensational allegations of gang activity dreamed up by IGI (Institutional Gang Investigations) and OCS (Office of Correctional Safety) and their informants, individuals they’ve rewarded for their fantastic lies and grandiose imaginations. Informants invent spectacular tales of slander, yet they themselves have worked in concert with the state, much like lackeys in a Third World country, instigating and spurring chaotic dissention and violence to benefit their handlers. CDCR now says it recognizes that new STG group affiliates and corresponding gang-type behavior has emerged within the department’s sensitive needs yards (SNY) population. Now remember we were told that SNY inmates were those who chose to debrief and disassociate themselves from the gangs, yet they have this gang-type behavior cropping up on the SNY yards. It begs the question, did these inmates debrief and lie on other prisoners in order to escape torturous conditions only to resume their prior criminal activity? Or did they debrief and lie on other prisoners only to be given greater access to resume their gang activity? Whichever it is, CDCR admits its debriefers are exhibiting the gang-type behavior that they’ve supposedly disassociated themselves from by providing information about others! The Madrid ruling changed absolutely nothing and gave prisoners no protection at all when it came to arbitrary gang validations, except to require their independent source item rule, with one item establishing a direct link to a validated member. Again, there is no interpretation of what a direct link is, which left the gates wide open to the scandalous imagination of the gang investigators to invent bogus gang validations as long as they established that one source item was directly linked to a validated member. They accomplish this in several ways: The most common at the moment is 1) during a debriefing you were identified as a member of X gang, or 2) during a cell search your name was discovered on a roster listing validated members of X, or 3) – this is a good one – you were found in possession of other validated gang members’ property. In In Re Cabrera, the California Court of Appeals interpreted CCR (California Code of Regulations) Title 15, Section 3378(c)(4), finding that in order to establish a direct link to a validated member or associate, IGI was required to prove that the prisoners formed a mutual or reciprocal relationship. Seemed fair, seemed reasonable; however, CDCR didn’t want the burden of having to prove its slander so they appealed to the California Supreme Court, claiming the lower court didn’t show or give enough deference to its judgment. And, as you might have guessed, the highly activist anti-prisoner court agreed, stating “courts are bound to defer to CDCR’s intervention of its regulations in gang identification process” (In Re Cabrera, 55 Cal.4th 693 (2012)). We’ll talk more about the California Supreme Court later. To date, that court has rolled back every prisoner case that’s come before it following a lower court victory for the prisoner – every one. Turning our attention to Castillo v. Alameda, this is another highly touted, highly publicized case that was supposed to change the validation process and afford prisoners substantially more due process in validation proceedings and supposedly change what source items could and could not be relied on without an articulable basis. A court cannot say this is ridiculous because Cabrera and other cases say courts are bound by CDCR’s interpretation of its regulations. That’s substantial deference. The California Supreme Court has rolled back every prisoner case that’s come before it following a lower court victory for the prisoner – every one. The articulation of a basis is limitless. Being validated, anything you do or say is characterized as gang activity – anything. When mail is confiscated, to scare and/or intimidate family, friends or the public, their basis is: “Gang members must communicate in order to recruit and spread their gang propaganda. They are known to use coded messages to recruit through the mail, etc.” This is a scare tactic. The so-called Castillo Agreement was supposed to have defined gang activity as knowingly furthering, promoting or assisting a gang in activities that violate the law. But what actually has become the definition of gang activity is any documented activity between validated gang members. This can be talking in the library or the yard, sharing a look or a simple hello. Being validated, anything you do or say is characterized as gang activity – anything. The changes Castillo purported to make to the validation process resulted in the mistaken belief that SHU review is to occur every six years as opposed to every 180 days. Courts, afraid to even question CDCR lawyers and the like, all accepted this erroneous persecution, despite Toussaint v. McCarthy, clearly holding review must occur every 120 days and said review must amount to more than meaningless gestures. While prisoners were told they could be released from SHU after six years of no documented gang activity – and true to form CDCR initially released about 90 prisoners from 2000-2004 and sent about 100 or so to Corcoran SHU – the word was Pelican Bay was releasing people. The same stunt is being employed now. CDCR says it has about 83 prisoners scheduled to be released per a case-by-case review. However, this was only a slick hoax. Those prisoners released remained under constant threat of being returned to Pelican Bay unless they debriefed. By 2008, 90 percent of all inactive releases had been returned to SHU. The process was looked upon by prisoners as a hoax designed to quell the brewing storm waiting behind parole, debrief or die! So here we are again with the new Security Threat Group/Step Down Program of 2012. We are again told that we can, via the SDP, be released from SHU without having to debrief, by participating in a five-year Step Down Program. Sound familiar? CDCR says it will implement an incremental four-year STG/STP which by design will replace the existing six-year inactive review process for validated STG affiliates. The STP will be an individual behavior-based program for STG affiliates that will provide graduated housing, enhanced programs, inter-personal interactions, as well as corresponding privileges and personal property enhancements for participating STG affiliates. Sounds a lot like the failed policies of the past. Get this: CDCR says additionally you have the responsibility to report STG or criminal activity when known or observed by you. This process is not intended to compromise your safety but to enhance your safety through the identification and removal of those involved in STG or criminal activities. Reporting your observations can be accomplished via many avenues, including 1) contacting staff directly; 2) writing a request for interview (CDCR GA-22); 3) notifying your counselor or classification committee; 4) writing a letter to the institutional gang investigator (IGI) at the address of your assigned institution; 5) writing a confidential letter to the warden of your assigned institution. If you have access to the inmate telephone system, you can call a friend or family member who is willing to contact the prison directly on your behalf so the staff can follow up and take your report confidentially. This cannot be reconciled with anything other than what it sounds like: a brainwashing. They expect you to report on the conduct of others around you and they give you several ways to do it. These kinds of requirements encourage inmates to lie. It appears that their mindset is about creating informants – snitches – because in their mind the only way one is not a threat is if he or she is an informant. No snitch, no threat. This is the prescription they have for our lives! The behavior and conduct of other individuals should not be the responsibility of other prisoners to report on. What the hell is this? The STG/SDP is nothing but more of the same window dressing with a new coat of paint. They now seek to employ more aggressive brainwashing techniques aimed at inducing snitching. We continue to be held here for the past 10, 20, 30 and 40-plus years because we refuse to be and/or become government agents. While they will undoubtedly release individuals, these individuals will remain at risk of being returned to the SHU if they fail to inform on the conduct of others. You must participate in the program. Without a real change of substance to the gang validation policies, the STG pilot program is only a continuation of the same old methodology of re-wording what already exists. They seem to think they’re dealing with children. They are trying to enforce a no-talking policy! Don’t talk to so-and-so or so-and-so or you’ll get a time out. They seek to have an entire population of men running around with their heads down, scared to speak or share simple reading material for fear of being validated. We continue to be held here for the past 10, 20, 30 and 40-plus years because we refuse to be and/or become government agents. If you’re already validated, this STG policy requires that you don’t associate with other STG affiliates. Remember, association remains undefined and non-STG affiliates will be validated for associating with validated STG affiliates. The entire gimmick is a catch-22. What is association? Personally we know it is anything they want it to be – reading newspapers, books and magazines, sharing a cell or simply a greeting. This is why the first requirement in their SDP contract is for you to comply with the double cell policy. What does that have to do with STG activity? It seems as though the conspiracy to continue using any old thing to ultimately create snitches and justify parole denials is actually at the root of their scheme. This conspiracy ought to be evident by the explanation given before the BPH (Board of Parole Hearings) by George Giurbino explaining the STG policy. It’s the BPH that’s been the chief validator of CDCR’s management policies, operating with a carrot and stick approach, validating otherwise sensational, unproven fabricated accounts of gang activity by issuing vague, lengthy parole denials with references like “You gotta get out the SHU” or “You have to decrease your custody level” or relying on confidential information that the prisoner has no knowledge of. So it’s no wonder the first place they ran to explain the rewording of their latest scam was the SDP. The SDP contract that one must sign before being placed in or advancing through the SDP, folks are reporting that it doesn’t appear to be a requirement. Well, that’s not what the policy says. In fact, No. 3 of the contract says, “Follow all staff recommendations and directives.” If by chance staff recommend that you debrief and you do not comply, you have violated the contract. The so-called STG disciplinary matrix is really a method to exact punishment for things like participating in a hunger strike or talking to another prisoner or the way you criticize them in the media or the subjects you study. The STG disciplinary matrix is a cheap way to exact punishment for your thoughts in a way that justifies your continued involvement in STG activities. It’s worth noting that the new STG disciplinary matrix has a violation for violating the STG contract. Interestingly now, CDCR admits that the STG policy is not entirely behavior-based. Of course not! Because it would be impossible to continue running this racket without having the discretion to fabricate and invent gang activity. An example is found in CCR Title 15, Sec. 3378, validation criteria being a direct link to a current or former validated member or associate. The only way to be validated on a link to a former validated prisoner is to debrief, so by hinging any validation on a link to a former validated prisoner is a gimmick to validate young, unsuspecting new prisoners when they arrive in the kamps, unaware of anything and intentionally placed around debriefers who then become the catalyst for their validation, and the cycle continues. The current STG policy still hasn’t determined what or who they will designate as a STG, because STG 1 members will be housed in segregation based solely on their validation. And while they are claiming to be moving away from focusing solely upon the groups they have traditionally focused on, like the BGF (Black Guerilla Family), the Mexican Mafia, Northern Familia (NF) and the Aryan Brotherhood (AB), it’s hard to believe that their supposed shifting focus won’t mean a STG designation for those traditional groups. They haven’t said. It’s like they want us to sign a blank contract and wait while they fill in the blanks. They say STG associates will remain in general population unless confirmed STG behavior or activities are present. If these behaviors or activities are present, the STG associate will be considered for segregated housing and placement into a five-year Step Down Program. Here’s the gist of it: A validation will still mean punitive segregation without being found guilty of anything at all, and validation as an associate will still mean a minimum of six years in a SHU. Until one advances through a maze of a five-year Step Down Program that now will employ advanced brainwashing techniques to induce snitching, i.e., reporting on the conduct of others. The STG pilot program is not a credible revision of the policy to supposedly end long-term solitary confinement based on status. There is nothing in the wording to prevent arbitrary validations, something Madrid was supposed to address, then Castillo. But each time the vagueness got vaguer, such as the term “training material,” which can be anything a validated prisoner reads or studies – anything. The stories are endless about what constitutes “training material.” Slavery is alive and well inside the free world. Anything you read can be considered training material if it offends them and enough prisoners read it. They want us to sign some vague contract that can be breached depending on their mood. But they refuse to agree not to fabricate information in order to target and validate prisoners they wish to remove from the general population and subject to long-term torturous conditions until and unless they debrief or submit to their brainwashing techniques. They steadfastly refuse to accept responsibility for subjecting thousands of prisoners to solitary confinement for upwards of 40 years for no justifiable reason, other than it has been profitable to do so. If they were required to prove the sensational allegations they create against individual prisoners, they couldn’t, which is why the court invented the grandest scheme of all called the “some evidence” rule (Superintendent v. Hill), which doesn’t require them to prove anything at all. So while they test the new STG policy as being some sort of reform of what they admit are draconian policies, we must not forget that they also sold their inactive policy as also being a correction of previous unconstitutional practices that were accepted by and justified in a series of unpublished rulings by the courts. As one looks at this so-called new STG policy, it really is an expansion of the validation model and a continuation of the six-year SHU terms upon an initial validation as an associate, albeit characterized as a five-year Step Down Program, where the coercive tactics to debrief will be applied more systematically at each step. As we have seen in In Re Cabrera, CDCR fought to remove the definite definition of the term “direct link” because to do so would defeat their purpose. They claim that we’re here because of acts of violence. We say, then charge us. Prove what you say! As much as our struggle is with CDCR and its policies, it is even more so a struggle with the courts and legislators that have permitted this to continue, not to mention the prisoners themselves with the courts’ slave-era approach to permitting prison officials to punish – and we know now that this is punishment – based on allegations, without our having been charged with or found guilty of any misconduct at all. Yet we are treated as if we had committed a crime, much like the institution of slavery was expanded by the U.S. Supreme Court in the Dred Scott decision of 1857. Basically the Supreme Court would decide a similar issue in Scales v. United States, 367 U.S. 203 (1961), holding: “In our jurisprudence, guilt is personal, and when the imposition of punishment on a status or on conduct can only be justified by reference to the relationship of that status or conduct to other concededly criminal activity …, that relationship must be sufficiently substantiated to satisfy the concept of personal guilt in order to withstand attack under the Due Process Clause of the 5th Amendment.” The Court concluded that without more, mere membership in an organization engaged in illegal conduct is not sufficient to establish the required relationship between that membership status and criminal activity. Since prisoners are essentially slaves, this reasoning does not apply. Prisoners are only entitled to minimum constitutional protection, since the state says prisoners’ status (segregation) is not for punishment but for safety and security (Toussaint). But when justifying this crap, they’re quick to paint with a broad brush that we’ve earned our way into SHU with acts of violence and other misconduct. They’ve had it both ways for 40-plus years. Charge us or release us – period! There’s 30 years’ worth of evidence of punishment based on status that they’ve substantially tried to justify with ploys like Madrid and Castillo, while actually changing nothing, one ploy after another. This ought to be revisited to determine, based on the 30 year period, are we being punished? And if so, then the Toussaint ruling ought to be carried to its only logical conclusion and mandate the full panoply of constitutional protections for those placed in segregation for so-called gang affiliation. If the U.S. Supreme Court can revisit the 1965 Voting Rights Act to determine, based on evidence, whether discrimination still exists in voting so as to determine whether the 1965 voting rights act is still necessary, then there is no reasonable reason why the ruling in Toussaint can’t be revisited for those very same purposes. In fact, in Wolff v. McDonnell, Justice Marshall advocated the in camera review of confidential informants which, of course, was rejected by the Court, citing legitimate institutional concerns. The Prison Industrial Complex (PIC) rose to its zenith on the backs of prisoners, and ultimately it will meet its decline on the backs of our united collective determined efforts. It is what they fear the most. The time is now. We have 30 years’ worth of evidence that shows state officials have abused their discretion by carrying forth old vendettas under the guise of gang suppression. The so-called STG disciplinary matrix is really a method to exact punishment for things like participating in a hunger strike or talking to another prisoner or the way you criticize them in the media or the subjects you study. If you thought the articulable basis was far out there, wait until that basis is employed in conjunction with the STG disciplinary matrix. In other words, the matrix is a cheap way to exact punishment for your thoughts in a way that justifies your continued involvement in STG activities. So while we find all manner of excuses to avoid acting, and while we lie in the corner and pretend it’s somebody else’s problem, ultimately we must drag ourselves to act. This is our problem. The martyrs of yesterday are not here. For decades folks would spout about what prisoners needed to do, when they thought the divisions were insurmountable. Well, our reps have done that so stop the happy-happy-feel-good talk and drag yourself to the table. What can you contribute? How can you support the effort? Those are the only questions that ought to be asked. Prisoners are well within their human rights to demand an end to state-sanctioned torture. Now is not the time to be intimidated into silence. If the courts will not act to protect our constitutional rights or provide us with the full panoply of constitutional protections when a so-called validation brings a wide array of punishments yet the prisoner hasn’t broken any rules, then it’s our duty to act. This crap has lasted this long because as a class we accepted it. The SDP is a hoax. It simply rehashes old failed policies. Our reps have put forth the correct solution that incorporates an experienced, comprehensive approach towards an end to long-term solitary confinement. It’s worth reiterating the reps issued the Pelican Bay Human Rights Modern Management Control Unit (MMCU), a counter proposal to the STG strategy published in the April 2012 Bay View. Send our brothers some love and light: Dadisi Kambon (Lorenzo Benton), B-85066, PBSP SHU, D2-101L, P.O. Box 7500, Crescent City, CA 95532-7500; Sitawa Nantambu Jamaa (Ronnie N. Dewberry), C-35671, PBSP SHU, D1-117L, P.O. Box 7500, Crescent City, CA 95532-7500; Abdul Olugbala Shakur (James Harvey), C-48884, PBSP SHU, D1-119L, P.O. Box 7500, Crescent City, CA 95532-7500; Sondai Dumisani (Randall Ellis), C-68764, PBSP SHU, D1-223L, P.O. Box 7500, Crescent City, CA 95532-7500; Mutope Duguma (James Crawford), D-05596, PBSP SHU, D1-117U, P.O. Box 7500, Crescent City, CA 95532-7500; Abasi Ganda (Clyde Jackson), C-33559, PBSP SHU, D2-107L, P.O. Box 7500, Crescent City, CA 95532-7500. This statement was transcribed by Adrian McKinney. CDCr is only resorting to desperate acts because we, as an oppressed prison class, have removed the justification that normally under these types of circumstances allow CDCr to brutally attack us like they have in the past, physically, for fighting against prison oppression. By implementing our protracted peaceful protests, we are able to neutralize CDCr from literally using their usual heavy handed violent approach as a means to suppress our peaceful protests. The peace protests that have been chosen are done so to limit all unnecessary physical interaction with CDCr officials, other than medical staff, for our medical concerns, while being able to peacefully protest our long term torture in solitary confinement and prison oppression, in which prisoners have suffered along with their families unjustly. Our only action is remaining in our cells and personally sacrificing ourselves due to the deliberate torture we continue to suffer at the hands of our CDCr captors, who have for 10 to 40 years inflicted much more pain and suffering on us as a prison class than we could ever inflict upon ourselves. Their current antics demonstrate that they will never stop subjecting prisoners held in General Population, Ad-Seg and SHUs to physical and psychological torture. It has become a part of their daily practice, embedded in their prison policies. This is why on April 11, 2013, IGI Frisk, SSU Swartz and SSU Manunu – authorized by Secretary Beard, who instructed OCS Chief Anthony Chaus, who sent a direct order to PBSP Capt. Barneburg – assembled at PBSP to show the Joint Tactical Force of SSU and ISU, which then entered into D-1 building, specifically E pod, with the intent of intimidating prisoners with their joint task force. IGI Frisk called out the names of cells 117 to 120 and 217 to 220. SSU Swartz was writing down all our names and alleged affiliates on a small note pad. All prisoners knew that these agents’ actions were an attempt to stop our peaceful non-violent struggle against CDCr. We prisoners are aware that the SSU (Special Services Unit) body of CDCr is exclusively used to terrorize our friends and family members on the streets. Therefore, this was an implied threat against them. Because if SSU wanted our names, all they had to do was get them from IGI or ISU. They could have gotten them off our picture identification cards that are posted in front of each pod before you enter them. These threats are real because CDCr has a history of carrying them out systematically. Therefore, we clearly understand the danger we and our families face. On May 14, 2013, a sergeant came into PBSP D-1 building and he laid out an elaborate retaliatory reprisal plan in response to our peaceful protest. Yes, we prisoners will be subjected to the same retaliatory reprisals. He went on to speak about a mandate wherein all floor officers will be receiving orders to strip all prisoners, participants and non-participants, for the upcoming Pelican Bay Human Rights Movement actions this summer. All prisoners knew that these agents’ actions were an attempt to stop our peaceful non-violent struggle against CDCr. Now these retaliatory reprisals are for one reason, to create the interactions that we prisoners have attempted to avoid. Yet we must not let CDCr strategies and tactics disrupt our peaceful protests. Creating a plan to attack prisoners is a clear sign that CDCr will never change their oppressive ways and that they will always run the CDCr with threats of intimidation and death. Their response is what causes the so-called “mass disturbance” which they then will blame prisoners for later. Their response is to manipulate internal strife amongst prisoners, which is why their plan blankets all prisoners, in order to plant the seeds of dissention for the sole purpose of inciting prison violence amongst the prison populace. They will attempt to provoke angry reactions to what they do to you. They will try to give you the impression that it is prisoners who are responsible for what they are doing to you. They will write you up frivolous CDCr 115 Rule Violation Reports (RVRs). These actions are to deter you from our current struggle to be free from solitary confinement and prison oppression. Now these retaliatory reprisals are for one reason, to create the interactions that we prisoners have attempted to avoid. Yet we must not let CDCr strategies and tactics disrupt our peaceful protests. Our families, friends – our sanity, our civil and human rights – are all worth fighting for and we all have suffered enough at the hands of CDCr. There will be no end to our suffering and our families’ and friends’ suffering if we as a prison class do not put an end to it ourselves through every peaceful protest at our disposal. 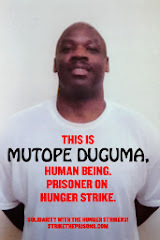 Send our brother some love and light: Mutope Duguma, s/n James Crawford, D-05996, D-1-117, P.O. Box 7500, Crescent City CA 95532. This letter was dated May 15, 2013.